Fujifilm launches instax SHARE SP-2 Smartphone Printer. FUJIFILM Corporation on Monday announce the launch of the instax SHARE Smartphone Printer SP-2, the smartphone printer which can print high-quality credit-card sized instant photos from smartphones in just 10 seconds. 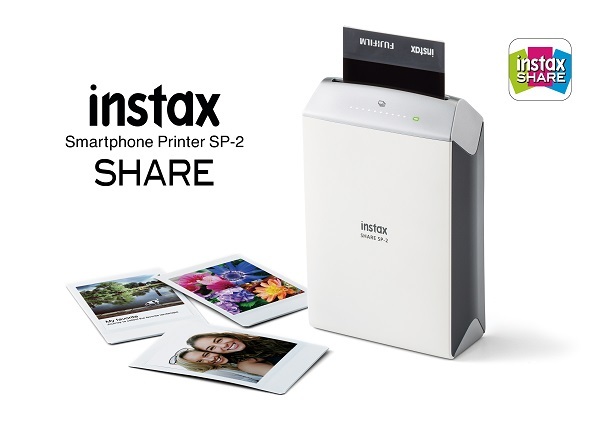 The instax SHARE Smartphone Printer SP-2 is available in Gold, Silver and priced at $200. It is compatible with Android phones with Android v2.3.3 or later and iPhones installed with iOS v7.1 or later. The instax SHARE Smartphone Printer SP-2 is a newly designed product which has improved image quality compared to that of the instax SHARE Smartphone Printer SP-1 and new functions to meet user's preferences and their lifestyle of taking and editing photos with smartphones. A higher image resolution and contrast are achieved with the adoption of a new exposure system of the instax SHARE Smartphone Printer SP-2. Also, the printing time has been shortened by combining the exposure and film output processes. When users send an image to the instax SHARE Smartphone Printer SP-2 via wireless LAN, they can get photos in just 10 seconds. In addition, new filters and templates have been added to the creative experience of the free instax SHARE app. Using the "Custom filter," the brightness, contrast and saturation of the image can be adjusted. With the "Collage template, " two to four images can be combined into one instax photo and with the "Split template, " one image can be split into two instax photos. 1. Create instax photos by printing images from iPhones and Android phones via instax SHARE app. When the "Real Time Template" is selected and a photo is taken, the date, place, weather, temperature, and humidity are indicated in the frame.